What's to be said about this Nexus 5 that hasn't been said already... and most of it was said before it was even released. I'll try to give you my spin on it anyways, because, why not. Problem is, I'll be giving you my review as a comparison to my daily driver (Nexus 4) and the recently reviewed G2. Wow, so talk about your hype over the past few months. I don't think we've talked about a device more before it was released, ever. 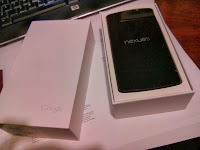 Being an Android fan, you can't but help to be excited about the Nexus program. So the leaks kept coming, and there was no event to announce it or Kit Kat. I think that's my biggest upset. They held a keynote at Google I/O and then a few months later held a special event just for some updates to Google+ / Photos, but nothing for their Nexus 5? Nothing to talk about Kit Kat? We had to do our own searching and digging (which I enjoy), but that was all killjoyed because most of it was released in leaks anyways. Left a sour taste in my mouth. Add in my financial difficulty with relieving myself of $400 I missed out on buying the new device. But really, what did I miss out on? Kit Kat would be coming to my Nexus 4, and I still love that phone. But the G2 really blew me away. It had a lot of 'new things' which kept me in awe. Would the spec jump alone keep me as enticed with the Nexus 5? Not a lot of differences there, except in the resolution. It's one failing I have with the N4 is that it does have a screen that it looks like I can see 'lines' now and again. True HD is REALLY nice, and although both screens use the same technology, the extra resolution on the Nexus 5. REALLY NICE. But still not enough to push me to drop the 4 and get the 5. How about that power? It's got 50% more processing punch... how does it handle? With the exception of DH4, I experienced NO LAG, no dropped frames, no stuttering. Now... my Nexus 4 handles nearly as well. Sure enough it might take a second or so longer to load up, or get going, but usability experience is pretty well the same. For Dungeon Hunter 4, I think it's the game that lags and slows down. Especially on those fights were like dozens of guys all come at you at the same time. This goes for any of the apps as well. Maps, Earth, GMail, Chrome, etc... nothing slowed this device down. It was a real treat to use, and throw in the trueHD and wow... just sit back and enjoy. Well, I was expecting more, seeing as the G2 came with 3000mAh and was just a champ to last all day, no questions asked, the N5 with it's 2300mAh last about as long as my Nexus 4 (which is just shy of a full day's use). Not bad. I loved +Aaron Kasten's comment of 'just shoot everything in HDR+, then Snapseed it with HDRScape after...' it fits. To be honest it takes very nice photos. I have taken some real gems. It comes down to how well you use a camera to begin with, but that's just my opinion. The Optical Image Stabilization didn't 'wow' me, but I think that's the point. I used it without noticing it happened. I think that's how it should work. As an example I took some shots on a cold day with my freezing hands and nothing was blurry, whereas my Nexus 4 you would definitely notice the 'not-quite-super-sharp-stillness' in the images. Where I really noticed it was when I digitally zoomed in (essentially going to magnify any 'blurring'), and I didn't observe any. Again, having a camera that is pretty much the same as the one I have didn't wow me.... however the stabilization was tempting. Again, pretty much anything it can do, my Nexus 4 can do now. Were I on the G2, I'd miss out on a lot then. I'll do a review on Kit Kat later, as there's no real need to attach it to the Nexus 5 review. Awesome phone. Factor in that it would only be $350 or $400, you can't argue that it's a perfect decision to buy it to upgrade a device... unless you've got a Nexus 4. Any other phone you can make the argument about Nexus updates or size, etc... but I just can't justify it with my Nexus 4. The biggest complaint I would have about this device, which I think is HILARIOUS to have at all is the speaker position. Sure you may say on the bottom is dumb, but I didn't mind it on the G2... however on the G2 the 'right' side grill was the speaker and the 'left' side was the mic. 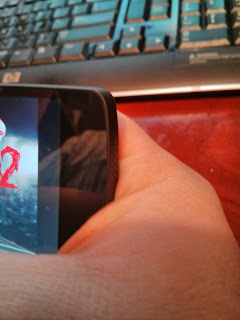 So, if I turn the phone sideways to play a game, usually my hand is blocking the bottom half of the phone (i.e. the left grill). On the G2 I never noticed that effect because I was never blocking the speaker grill. On the Nexus 5 I do it ALL THE TIME. It's really hard to play some games where I NEED that audio cue to react. So it's HIGHLY annoying. The real clincher for me to stay on my N4. I guess in the end I was hoping more for the Nexus 5 to be closer to the G2 than it was to the Nexus 4. Had I the money, I'd go for the G2 and root it. Had I only a little bit more money, then I'd go N5 and sell my N4. Where I am, I'm happy and I don't feel like I'm missing out.